This Week: Rahil Mohsin knows an artist needs a style. 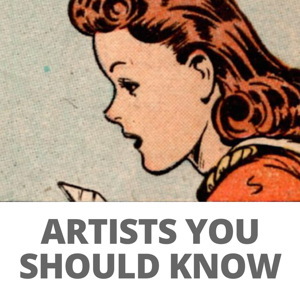 It’s a silent signature and a distinctive feature that determines the type of stories artists in comics are best fit for. But what if you could have two styles. Or five. Or ten? As articulate as he is versatile, join me as I sit down with Mohsin to discuss his cartoon influences, the creative process he goes through to alter his style for each comic he draws, and all the challenges and successes that stem from that process. Alex Lu: Rahil, tell me about your artistic history. What were the comics that inspired you to want to make comics and what did your path to becoming a professional cartoonist look like? 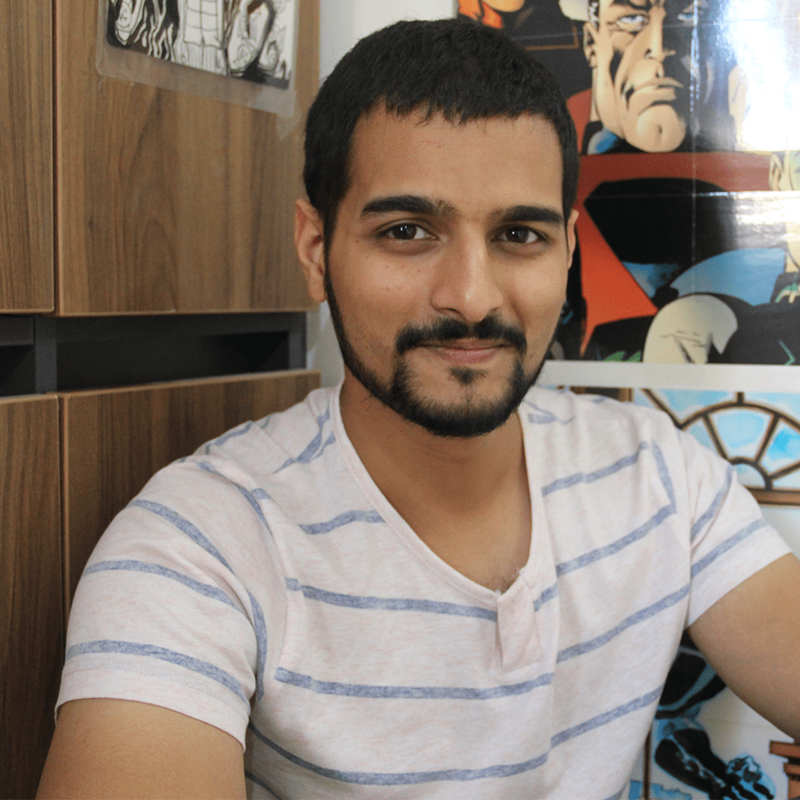 Rahil Mohsin: I was born and brought up in Bangalore, India; growing up, I was exposed to comics like TinTin and numerous local Indian comics that caught my attention. It was my exposure to books like Johnny the Homicidal Maniac by Jhonen Vasquez and Lenore by Roman Dirge that got me into taking comics seriously. My experimentation with the medium began as a feverish attempt to pay homage to these great guys. 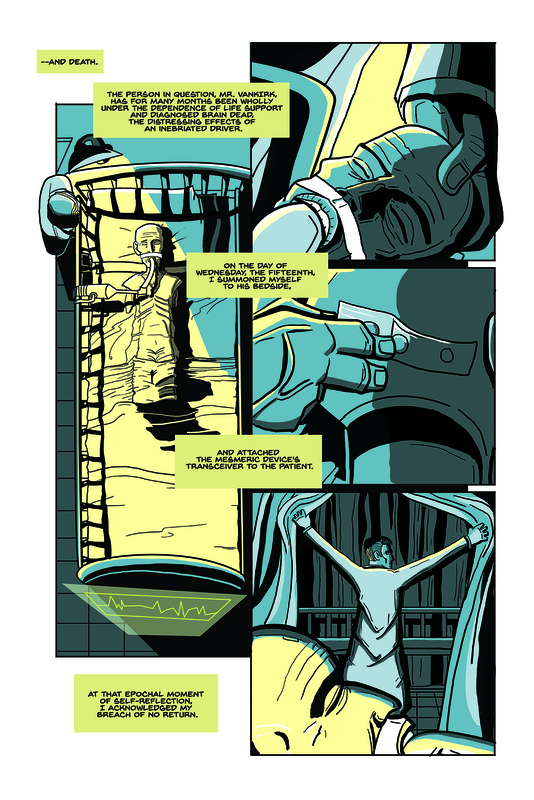 I began illustrating comics professionally for Sufi Studios who at that point were looking for an artist to convert moral, spiritual stories into sequential art. It wasn’t really my forte, but I gave it a shot. 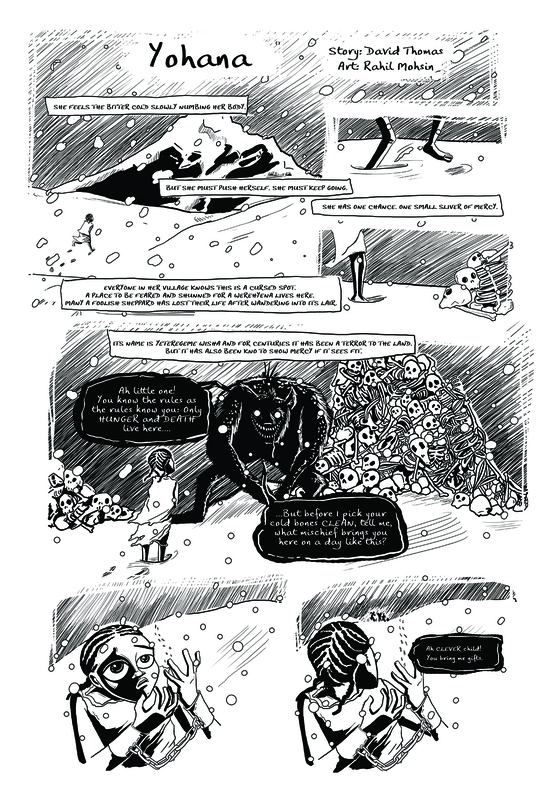 The initial stages were very challenging but accepting the change helped me churn out three graphic novels for them. Lu: Compared to the western comics scene, what is the comics culture in India like? Were there any interesting differences in the style or content of those comics that you’ve brought over to your work in western comics? Mohsin: The Indian comics scene, in a way flourished due to the advent of western comics in the Indian market. There was a lot of potential with new comic book houses being set up with stories mostly being set in India to help cater to a more local audience. Most of my collaborators have stories set in any place but India, so there was a lack of opportunity for me to bring some element from Indian comics into my artwork. 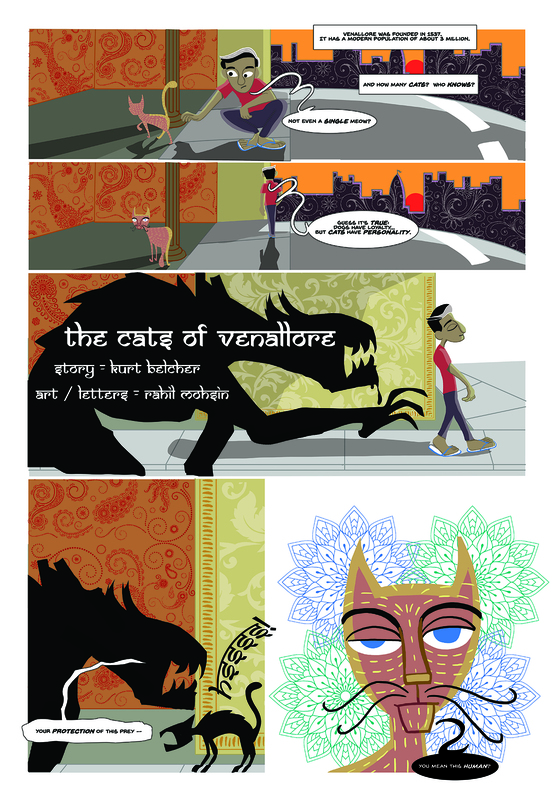 Except for one Lovecraftian short I’d illustrated for Kurt Belcher called The Cats of Venallore which was set in India. Being a fan of Sanjay Patel’s Ramayana, I tried to create a similar art style to do justice to the setting. Lu: When I look at your body of work, one of the first things that stands out to me is your penchant for experimentation. Would you say that there are any constants to your style? And what drives that desire to make each of your works so dramatically different from one another? Mohsin: At some point in my career, I became obsessed with David Bowie’s music and was rather fascinated by the term ‘chameleon artist’. I wondered what it would be like to get out of one’s comfort zone with every new project. Lu: What are some of the challenges you’ve found that stem from constantly changing your artistic style? Mohsin: Revisiting a previous project for reasons like rework or creating a sequel, while working on a different art style for another project, has posed to be quite a challenge most of the time. Making the switch from one style to another doesn’t always happen immediately and the gradual process of getting re-accustomed to an old style can be frustrating at times. Lu: Thematically, I notice that a lot of your stories focus around cats. What draws you to these stories? Do cats have any personal symbolism to you? Mohsin: Personally, I am attached to cats. There was a time when stray cats for no reason began visiting our house, making themselves comfortable and easily becoming a part of the family. You just can’t help but get attached to the little furballs. Once the cats stopped coming in, it’s bizarre, but I began working by writers who coincidentally had cats in their stories, either as the protagonist or a supporting character. I can’t really explain it, but it’s uncanny how cats have gradually begun invading my creative life as well. 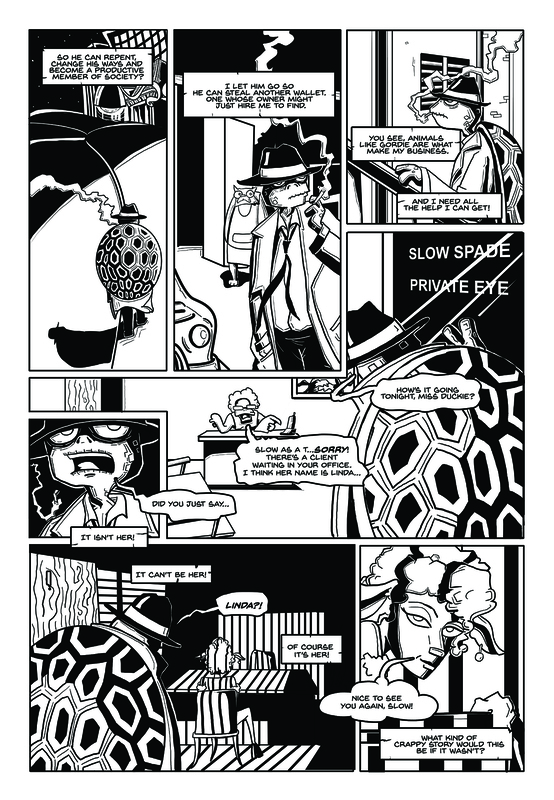 Lu: In your new work, The Big Sheep, I see hints of underground comix cartoonists’ styles blended with the distinct trappings of a classic noir story. How did you go about figuring out what style you’d employ for this books and for all your books more generally? Mohsin: The art style used for The Big Sheep was inspired by Jhonen Vasquez’s work and developing the art style wasn’t really a challenge for me since I’d dabbled with this style earlier before becoming a professional cartoonist. The only challenge was to create anthropomorphic characters though. This was my first experience creating such characters, which meant that my research spanned from what made Mickey Mouse tick to Sin City. This may sound bizarre, but most of the time I let my subconscious guide me to create an art style. I would obsessively read a script, to the point of memorizing each scene until a mental visual is imprinted in my subconscious. And when I wake up the next day, I just have an art style; not necessarily in my first attempt but the basic look is out there and all that’s left are a few tweaks. Sometimes I also try to pursue my obsession with 90’s animated cartoons and try to incorporate the art style in a suitable script. 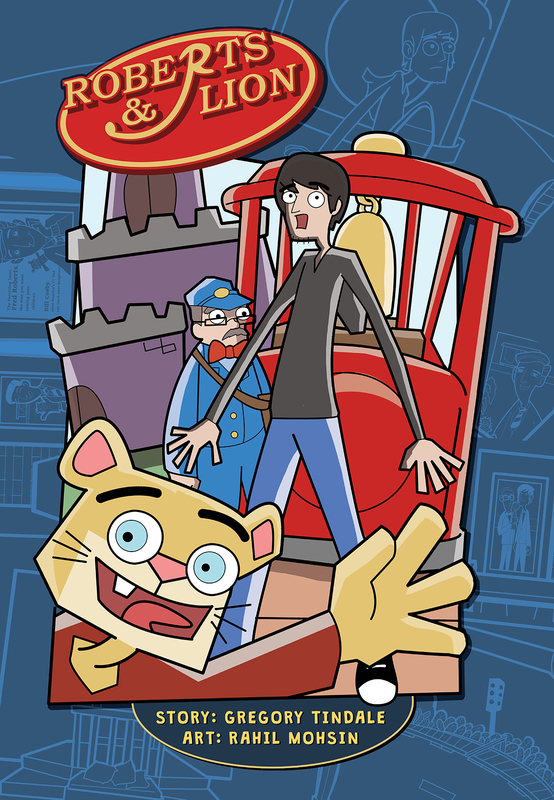 Lu: What are some examples of 90s cartoons you’ve been aching to find the right script for so that you can emulate their style? Mohsin: Cartoons like The Fairly Odd Parents, Dexter’s Laboratory, Johnny Bravo, Powerpuff Girls, Invader Zim and Foster’s Home for Imaginary Friends have been my all time favourites and to this day, I watch them on a regular basis. Most of my recent scripts are fun and have a very cartoony vibe to them which has really given me the opportunity to try out these art styles. 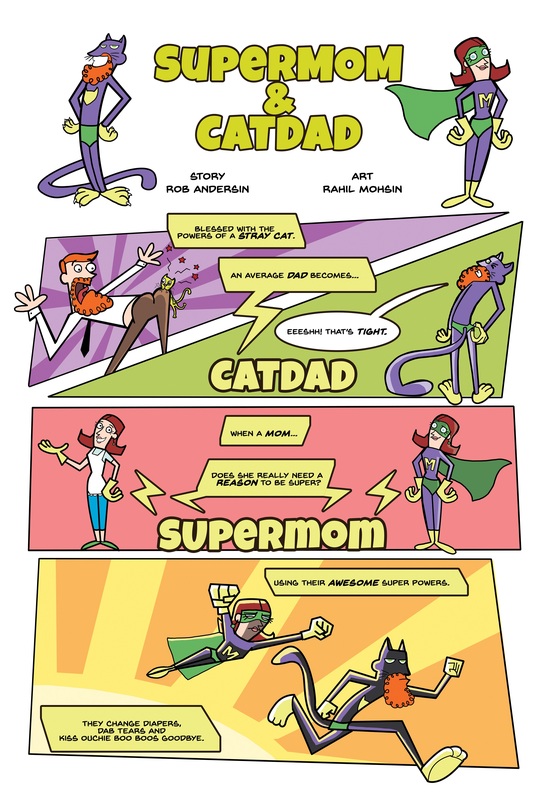 Supermom & Catdad by Rob Andersin was one such project that gave me the chance employ the style used in Fairly Odd Parents and yes, I have been aching to get back to something like that soon. More recently, Roberts and Lion has also given me an opportunity to create an amalgamation of art styles used in Dexter’s Laboratory and Invader Zim. Lu: More generally, what kind of stories do you hope to tell in the future? Is there any type of story, whether it be romance, drama, noir, or otherwise, that you feel yourself gravitate towards? Mohsin: I had begun working on horror, but now I feel drawn more towards silly, fun, cartoony stories with a bit of satire in them. And I do hope that I continue working on all of the aforementioned genres. Lu: A lot of your work so far has been on the shorter side. Roberts and Lion seems to hint at turning into a longer project, though– is that the intent? 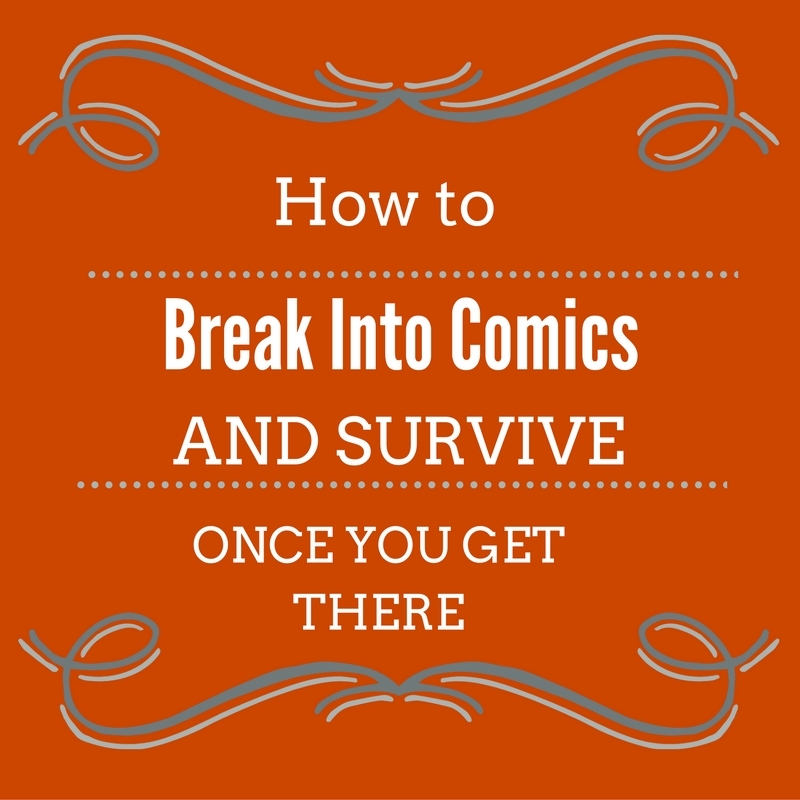 And if not, do you ever envision yourself on working on a graphic novel or a longterm series? Mohsin: Yes. Roberts & Lion is going to be a longterm series and i do look forward to working on more such series and hopefully a graphic novel, either written by me or in collaboration with a writer.